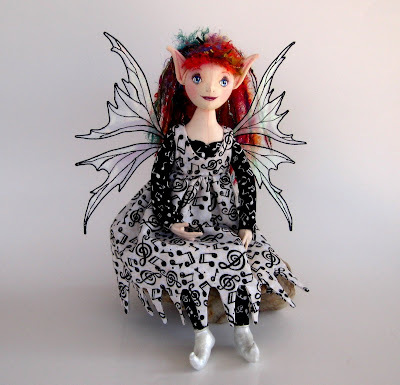 The Fairies Nest - OOAK Cloth Dolls & Fiber Fantasies: An Interview!! FiddleLee on Etsy did an interview with me that's up on her blog, Etsy Treasures, this week. She did a great job and any incoherences are mine so go read it and leave her lots of comments! Heck, leave me comments here, I'd love to know what you think! And to liven up this post some, here's my latest fae, Calliope the music fairy. Her hair is actually even brighter in real life..VERY colorful! she's Fabulous!!!!! I love the music graphic on her clothes! So when are you sending her to me?? PS, thanks for the support on the recent rant - I'm going to be getting away from the blogosphere and trying to get back to work. Great interview! I read it on the sly, here at work, and you were anything but incoherent. Calliope is beautiful, the detail of her wings literally pops off the page. I bet she is stunning in person. What a beautiful fairy! I love the musical dress. Lovely. Have you ever considered a "snarl fairy." One visits my daughter EVERY night. I would love to find her. oh my she is beautiful!!!!!! congrats on the interview...so fun!! !